A car seat can be used only so much. We do not believe there are parents that always carry their children in the car seat, are always on the move. That would be jut against common sense. After all, even if do not consider some of the child’s needs he needs to attend to, no child can remain in a car seat for a prolonged period of time. That would be simply unhealthy. That said, a car seat is rarely left in the car. Sometimes, the car in question is simply someone else’s, sometimes, the parents need to move it to another car or even put it away for a while. How can this situation be handled? 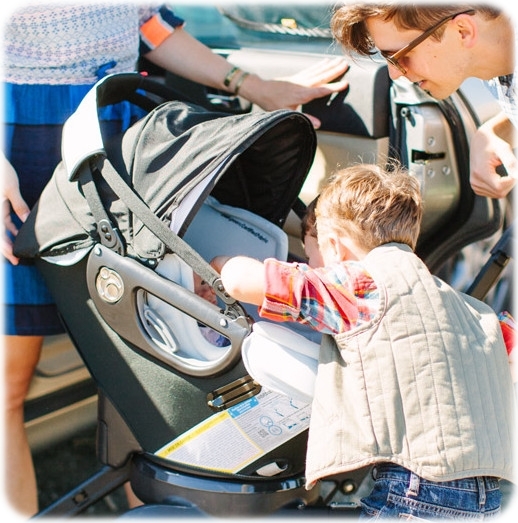 The car seat travel system and the car seat/stroller combo are two of the possible solutions. The differences between them can be neglected for the purposes we are considering now. 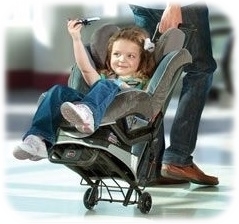 What makes them special is that a stroller compatible with a car seat is capable of accommodating the latter. You can easily leave the car seat attached to the stroller. However, while a good decision, this can always be suboptimal. The reason for that is that only an infant car seat can be part of a car seat travel system, to say nothing of the fact a stroller is rather hard to fold up with a car seat attached. In short, this is a good way to transport your child outside a car but not the car seat itself. As a rule, that is something relatively easy to do. Almost all car seats have a handle to take the seat and carry it somewhere. That is true, but again, those seats are mainly infant car seats, although convertible car seats often have a handle too. Car seat boosters, on the other hand, have nothing of the sort, unless they are three-in-ones. Nevertheless, the handle is used mostly to carry the child for short distances even with infant and convertible seats. Carrying the car seat for long distances is very unhandy. The handle is not meant for that. Transporting the car seat in the box is one of the most optimal choices if you are travelling for long distances. However, it is only true if you are transporting is as luggage. Otherwise, transporting the car seat becomes hard, to say the least. Transporting the car seat in the box is a good choice if you are going somewhere by plane or, perhaps, train or some other less traditional means of transportation. However, even if you are using a bus or are going somewhere by foot, you will find out just how unwieldy the box is. Nevertheless, the same is true for every other means of relocating a car seat, with the exception of strollers since they are designed for travelling on foot. Nevertheless, there is an ultimate solution. A car seat bag is one of the best options. 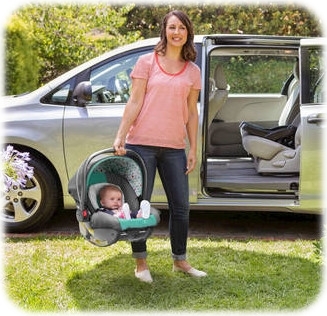 Naturally, you cannot carry the car seat with a child in it that way but if you need to transport the car seat itself, this is the best option possible. 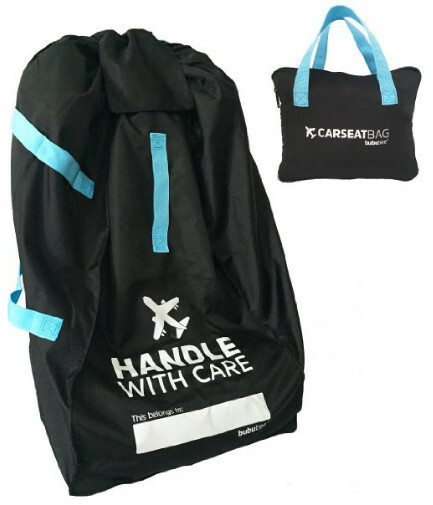 Usually, the car seat bag is used to get through the gates, when you take the seat with you on the plane, rather than let go on its way with the luggage. If you want to gate-check your car seat, a car seat bag is your only reasonable solution. 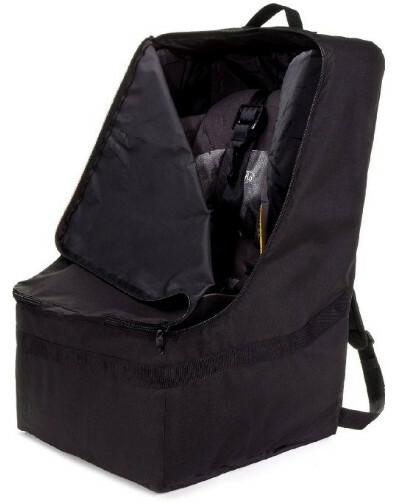 The Baby Seat Travel Bag from ilovebaby is a nice waterproof car seat bag. It can easily accommodate an infant or booster car seat. 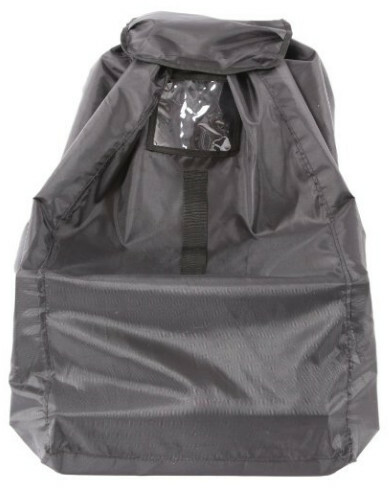 The bag protects the car seat from dust, germs, rain and other elements. 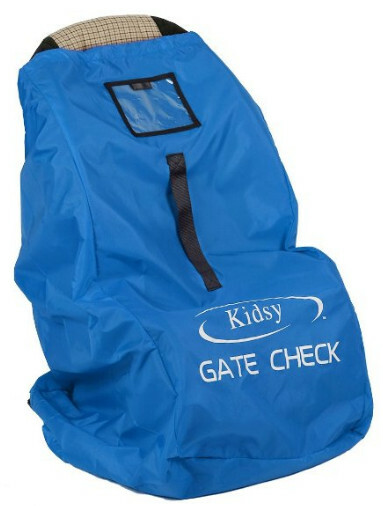 The bag can be used for gate checking or simply carrying the seat around. Do make sure that the bag with a seat in it is handled carefully if you prefer to let it be handled as a common luggage! You do not want anyone throwing the bag around. That might make the car seat unsafe to use. A car seat is only designed for a single major car crash. Throwing a bag with the car seat in it around will do to it almost the same thing a collision would have. At the very least, the consequences for the seat’s usability will be the same. Nevertheless, this bag is one of the cheapest car seat bags around. It does not provide any special protection features for the car seat, but you can still carry car seats in it. That is much handier than the alternatives. If the other bag can be used for gate checking and air travel, the Gate Check is apparently designed for that specifically. Even the name itself is a clue. Making the car seat a carry-on item is very easy with this bag. 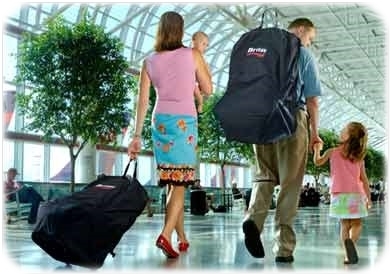 Nevertheless, gate checking, naturally, is not the only thing this car seat bag is useful for. The bag can be carried similarly to a backpack and it comes with two shoulder straps. Carrying the Gate Check bag that way feels completely natural to the one who carries it. It should be noted that the bag is very durable and can easily last for years provided you are not travelling all the time. Even then, it will last for a very long time. The bag’s durability is very useful. Not only does it let to use the bag itself longer, it also protects the car seat from tears, germs, and the elements. In fact, the material the bag is made of has been compared to bulletproof fabrics, although the bag is not technically bulletproof. Despite the number of advantages, this bag is not very expensive. 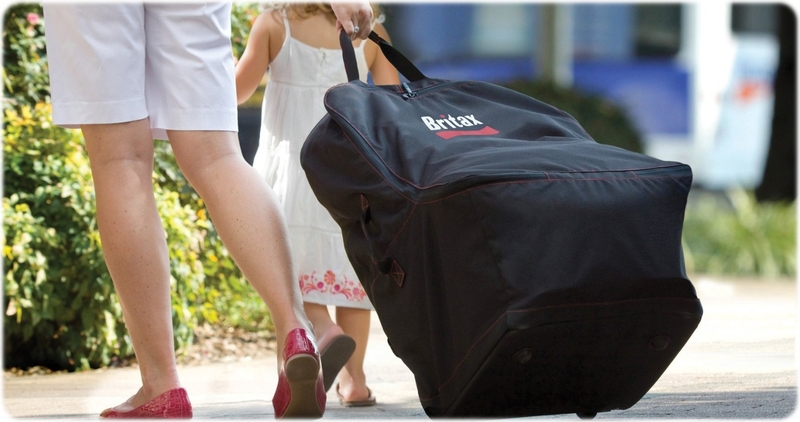 Some people claim this car seat bag to be the best one compared to the others in its class. The seller does that, for one. Now, the seat may not be the best of the best of the best but the claim is not completely unfounded. The Bububee ‘Elua is indeed a very good and reliable bag. One of the special things about it is that it was designed by a former airline employee who also was a mother. There are many engineers and designers in the world but not many of them have any major experience with air travel and then come to designing bag for car seats. The bag fits most car seats, including booster seats. Naturally, being designed with as much care as it is, the ‘Elua is water-resistant and tear-proof. It is made of neoprene. It is extremely easy to carry since it comes with a number of straps, including 2 padded back straps, a front strap, and 2 side straps. That means several possible ways to carry the seat. If you believe carrying the bag in a certain way is inconvenient, you can choose another any moment you wish. The seat is only intended for gate check use. Anything else would be suboptimal. But at least this seat is not very expensive, although it is definitely more expensive than the other two seats already reviewed above. This car seat bag has what some people would consider a very important disadvantage. This bag is made in China. On the other hand, it is a bag, not a car seat. Not that Chinese car seats are necessarily bad. Anyway, the Childress Ultimate is a very popular bag. Although trying to get a popular thing is not wise in general, in this instance doing so will actually be a good choice. The bag may be a bit too bulky and hard to store when you do not need it, but otherwise? A perfect car seat bag. Most good bags for car seats are rather sturdy, waterproof and hard to tear. So is the Childress Ultimate. However, there is a catch. This bag is thoroughly padded so as to prevent or, at the very least, lessen significantly any physical damage the seat could otherwise receive. The bag also has ergonomic straps, padded for your comfort and convenience. The bag is relatively cheap although not as cheap as some other bags. 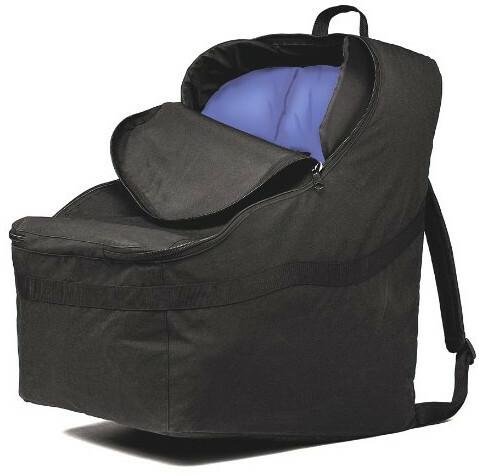 This bag has been designed to be compatible with any car seat, regardless of its type and size. The only car seat that could not fit into this bag is the vehicle car seat. As far as children safety car seats go, you should not be worrying at all. Chances are your car seat will fit perfectly. That is the idea, after all. Much like almost every car seat in this top list, the travel bag from Zohzo is waterproof. It is also very durable. In fact, this particular bag is made of heavy-duty materials. The interior of the bag is heavily padded to prevent damage to the seat. The lockable zipper makes the bag even more secure. Perhaps, some might think it is a bit too much for an airport but you never know what kind of duress a bag with a seat in it can be put under beforehand. It is always better to be prepared. The bag is extremely easy to carry around hands-free. It comes with shoulder and waist straps. The best part is that it is not exactly expensive. It may be more expensive than the other car seat bags but the price is not too high in general.